Exfoliating is one of the best ways to transform aging skin and let your true beauty shine through. Exfoliation removes dead skin cells that cling to the skin's outermost surface, leaving skin feeling smoother, fresher and younger looking! It can help reduce fine lines and wrinkles and even prevent new ones from forming as well. It also helps you make the most of those expensive moisturizers and serums by penetrating the skin more effectively without causing breakouts and irritation. Our skin is constantly generating new skin cells and sending them to the surface. As the cells rise to the surface they gradually die and become filled with keratin. These keratin filled skin cells are essential because they give our skin its protective quality. However, they are constantly sloughing off to make way for younger cells. As we age the process of cell turnover slows down. Cells start to pile up unevenly on the skin's surface, giving it a dry, rough, dull appearance, where fine lines and wrinkles develop. Exfoliation removes dead skin cellls that are clinging on, revealing the fresher, younger skin cells below. 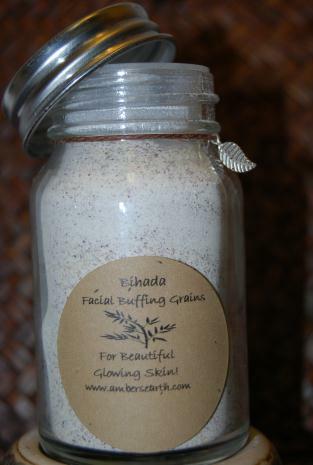 Here are my top natural exfoliating products for face and body. 100% Natural, Organic and Vegetarian. "Bihada" is Japanese for "beautiful skin". Create a natural, healthy-looking glow with gentle foaming and exfoliating washing grains to remove dead skin cells while deeply cleansing to reveal soft, smooth, refined skin. Fine lines, wrinkles, acne and scars gently fade away. This scrub is gentle enough to use every day on all skin types, even mature, delicate and sensitive skin. When used as a scrub, this delicate powder gently exfoliates and deep cleans the skin, leaving it glowing, tightened, and silky-smooth. It has even been described as being the closest thing to a face lift without the need to undergo surgery. This is my top pick because it's 100% natural, organic, one of my favorite exfoliating products and I cannot get over the results. Available at Amber's Earth.com, $20 - $35. Refills $10 - $30. Free samples available. Carly's Anti-Aging exfoliant is one of my favorite natural exfoliating products to gently exfoliate my skin and treat it at the same time. 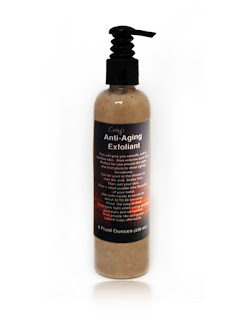 This all natural, anti-aging exfoliant is packed with anti-aging ingredients like Shea butter, Jojoba oil, Kukui nut oil, Argan oil, Hemp oil and Roobios tea as well as other natural oils to effectively clean, exofliant and treat skin at the same time leaving it feeling ultra soft, clean and refined. It also helps smooth, soften and eliminates wrinkles when used regularly, energizes your skin to produce new skin cells, evens out skintone and they even include a free full size bar of natural soap included that lasts for months! Carley's Clear and Smooth also carries natural acne treatments, soaps, body washes, moisturizers and mineral foundation. Available at Carley'sClearandSmooth.com - $16. This innovative and effective scrub deeply nourishes, tones and brightens as it removes dead skin cells, preparing skin for maximum moisture absorption and even color distribution. 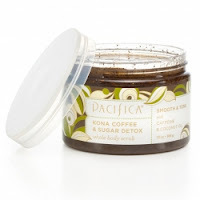 Sugar and sea salt exfoliate, while amazing coconut oil – rich in vitamins and essential fatty acids – feeds, replenishes and hydrates for skin that is supremely soft and supple. With super-caffeinated benefits, it improves the appearance of skin texture as it stimulates. This is a top pick because of the coffee and sugar mix. I love the smell and it exfoliates effectively without drying out skin. 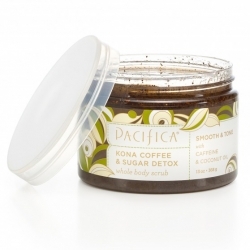 Pacifica carries a wide selection of natural body scrubs, washes, soaps, butters, fragrances and gifts. Available at Pacifica.com - $28. 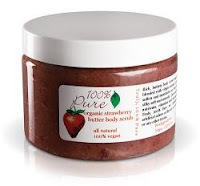 100% Pure Strawberry Butter Body Scrub is a rich, buttery body scrub made with strawberries blended with Virgin Coconut oil and Shea Butter to soften and moisturize, so your entire body will be silky soft and smooth. Jam packed with nourishing nutrients, vitamins and anti-aging antioxidants. There are no synthetic fragrances, no artificial colors or flavors, no synthetic chemicals, or any other toxins. Don't like strawberry, they carry many other body scrubs, butters, creams, washes, skincare, cosmetics and gifts too! Available at 100%Pure.com and Apothica.com. - $32.